Where you are: Home / Mountain guiding / Winter Ascents in the Slovenian Alps / Winter Ascent of Triglav by the Slovene Route in Triglav North Face. You can make a winter ascent of the highest, mightiest and widest face of Triglav – the north face. It’s so mighty that we call it just ‘The Wall’. The Slovene route is the easiest climbing route of ‘The Wall’ in both summer and winter conditions, and you will discover all its secrets. The Slovene route is the easiest climbing route of the north face of Triglav and should be on the wish list of those with a desire to climb ‘The Wall’. The Slovene route has a heart and history. It is a classic route that our parents and grandparents used to guide and climb. Among all the Slovene routes around the world, this one in ‘The Wall’ remains the most respected and honoured of them all. The ‘Slovene’ route – one of the most beautiful route in the Triglav north face wall has a special place in the classic Triglav routes. For the experienced, it isn’t overly difficult and the gaps, gigantic rocky kingdom and charming ledges provide a great experience. The classic ascent takes one day. 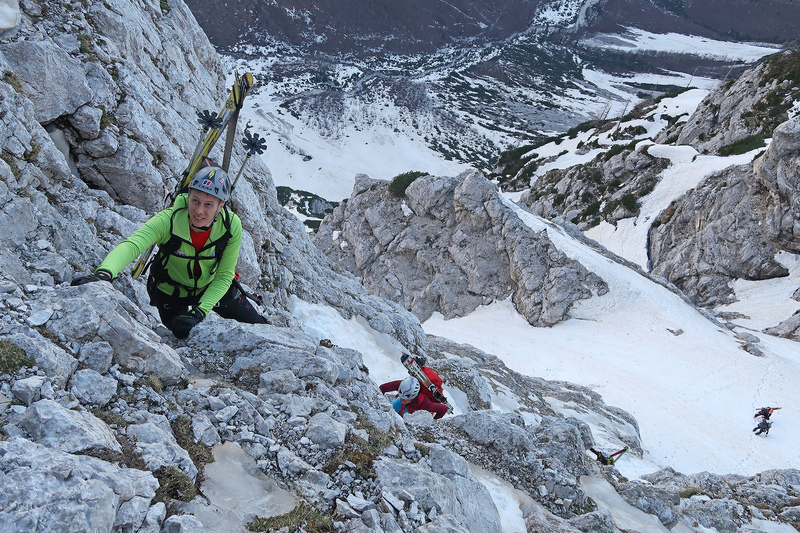 Should you choose to include an ascent to the summit of Triglav, we recommend a two-day tour. The Julian Alps, Triglav north face. Appropriate mountain clothes and shoes, helmet, climbing harness, axe, crampons, backpack, 2x locking carabiner, 120cm sling, and any additional equipment as recommended by your guide. Participants who have previously booked activities with Kofler Sport receive a 10% discount.